Vasa Museum - The museum's centerpiece is the 17th-century warship Vasa, the oldest, fully preserved ship in the world. Built as the flagship of the Swedish navy, the Vasa foundered on her maiden voyage. The wreck was discovered and raised between 1956 and 1961. After your guided tour, enjoy free time to explore the museum's other exhibits and displays of historic items recovered from the harbor floor. City Hall - Stadshuset is the seat of Stockholm's city government. The massive, fortress-like red brick structure is crowned with a tower and a cupola topped with the three golden crowns of historic Sweden. Your tour includes the Blue Hall, scene of the annual Nobel Award banquet, and the Golden Hall, with its immense mosaic illustrating Swedish history. Old Town - Join your guide for a narrated walking tour of Gamla Stan, where Stockholm began over seven centuries ago. Stroll the narrow, cobbled streets and see buildings ranging from the 16th to 19th centuries. The district is home to art studios, chic boutiques, restaurants and shops. 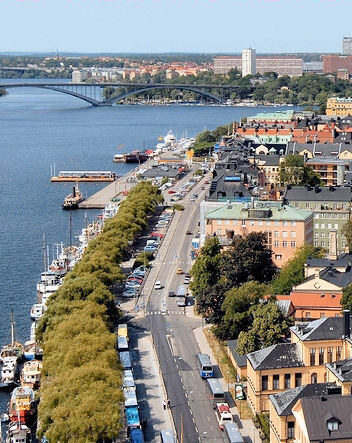 Fjallgatan - One of Stockholm's highest points offers panoramic views of the city skyline and its graceful waterways. Royal Palace - From Blasieholmen photograph the 18th-century royal palace from a vantage point opposite Old Town's waterfront.